Some plants are aluminium accumulators and can be used as an alternative source of alum for mordanting. Among them are clubmosses and I have written in an earlier post about how clubmosses were used in the past as an alternative mordant. Another alternative source of alum comes from the leaves of species of Symplocos. The leaves of Symplocos racemosa are used in parts of India as a source of aluminium mordant and in Indonesia Symplocos cochinchinensis is used in a similar way. The Bebali Foundation is the organisation behind The Plant Mordant Project which aims to empower women in Indonesia by building partnerships for sustainability with rainforest communities and indigenous textile artists; the sale of dried Symplocos leaves for mordanting is part of this project. 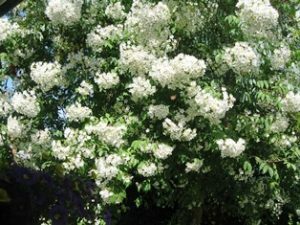 The website www.plantmordant.org provides a wealth of further information on this project and also gives details of where to buy the powdered leaves and how to use them. This extract from their website explains the work of The Plant Mordant Project. “The Plant Mordant Project offers natural dyers a unique opportunity to avoid mordants produced by industrial processes and make reliable colors 100% from plants. Powdered leaf from Symplocos trees can replace alum in conventional natural dye recipes and produce some exciting new colors. Natural dyers already chose plant dyes over synthetic dyes because they are aligned with their values, and the Plant Mordant Project offers an opportunity to extend the expression of these values by also using a plant-sourced mordant. Symplocos leaves can be used on all fibres; so far I have only used them on wool and I am pleased with the results. One thing to bear in mind is that Symplocos leaves also yield a yellow dye, so the yellow colour of the mordanted fibres may have an effect on the colours achieved from the dye pot. However, I found the colour difference on madder-dyed wool when compared with wool dyed on a traditional chemical alum mordant was very slight. I used the powdered leaves at the rate of 50% weight of the fibres and simmered them in rainwater for about 30 minutes until they sank to the bottom of the pot. I used rainwater because the recipe stipulated “soft water” and I live in a hard water area. I then strained off the liquid and allowed it to cool to 40C as directed. I washed the wool thoroughly and then soaked it in a weak solution of washing soda (soda ash) as directed in the recipe. (I suspect this washing soda soak is probably more relevant for use in areas where dyers may not have easy access to other wool washing materials. The important thing is to make sure the fibres don’t have any grease or dirt adhering to them.) I then added the wool to the cooled mordant solution and slowly raised the temperature to simmering point (95C) over a period of one hour. I allowed the solution to cool then removed the fibres and rinsed them. The fibres were a medium yellow colour, although the recipe said they would be a”pale shade of yellow”. In order to be able to compare the effectiveness of Symplocos leaves as a mordant, I added samples mordanted with two other types of alum mordant – 10% aluminium sulphate and Kaltbeize AL, a cold mordant of aluminium formate, which I have written about in previous posts. I also added three further samples – two mordanted with different sources of tannin – blackberry leaves and shoots and oak galls – and one treated with rhubarb leaf solution. 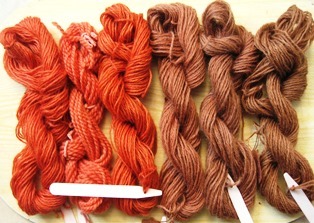 I then dyed all the skeins shown above in a madder dye bath. 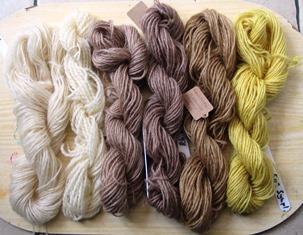 The photo below shows the madder-dyed skeins in the same order as the undyed skeins above. The photo below shows more clearly the difference in shade between the three types of alum mordant. 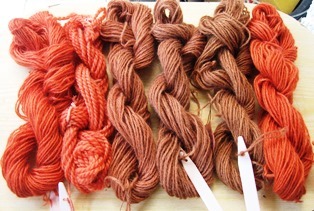 The symplocos-mordanted skein is the third one from the left and it is only very slightly more orange in tone than the skeins from the other two alum mordants. The second skein may appear slightly paler than the first skein but this is because the wool used for the second skein is more loosely spun and this may have caused the slight colour difference. My conclusion from this first experiment using Symplocos leaves as a mordant on wool is that they provide a useful alternative source of alum for mordanting, especially for those dyers who prefer to avoid manufactured chemicals and to use only plant materials. The colour obtained from madder on wool using a Symplocos mordant is virtually the same as the colour from an aluminium sulphate mordant and the initial yellow colour of the mordanted fibres seems to have an insignificant effect on the colour obtained. I used the remaining Symplocos solution to dye two wool skeins an attractive shade of yellow but I intend to experiment with them to see if the remaining solution also contained enough aluminium to have a mordanting effect. 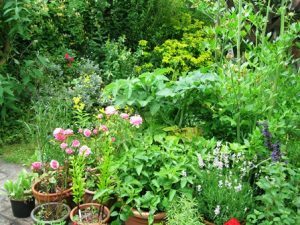 Although my garden is small, I try to cram in as many plants as possible and to make the garden as colourful as I can. 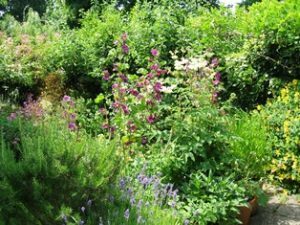 I plant mainly native plants and plants with flowers that will attract bees and other beneficial insects. 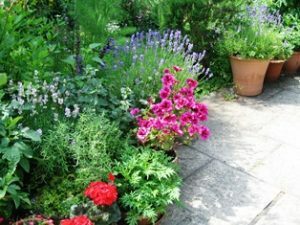 The garden always seems to be humming with bees and when sniffing the scented flowers I have to make sure not to disturb the pollen gatherers! 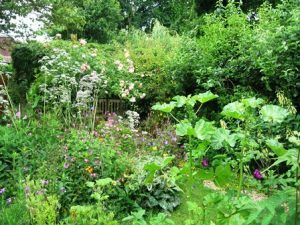 Here are some photos of the garden in June. 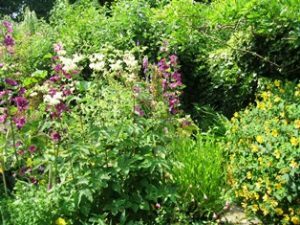 When the much-needed rain has stopped I’ll take some photos of the dye garden, which is beginning to look rather overgrown.